We use Secol products to protect our own collection of postcards and photographic items. In terms of archival quality they offer the best possible specifications for the protection of your treasured collection. Secol Polyester Film perfectly fills the often conflicting needs of conservation, protection and accessibility. It is a chemically inert, extremely clear and immensely strong material which uniquely combines security, long-life functional use and versatility for all kinds of material formats. Independent testing by the British Museum has approved Secol products for permanent use with photographic material, printed and paper based collections, and Secol materials have also been tested and passed to the PAT (Photo Activity) Test ISO 14523. (Data from Independent tests performed at the Image Permanence Institute at Rochester Institute of Technology). 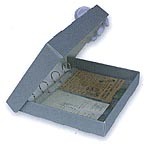 The Secol A-S System: the standard choice for curators, collectors, photographers and many other professionals for decades.As a unifying solution for disparate ephemera it is unsurpassed, providing supreme protection and highly accessible convenience by combining a solander-style clamshell box with an internal ring-binder system for the Secol polyester based A-S Storage pages in a wide variety of popular formats. When stored on a shelf, the double clamshell provides a superb barrier against light, dust and dirt, whilst the drop-spine design allows full 180 degree access to Secol Polyester pages when opened up for use. Construction is based on an archival boxboard frame (neutral pH 6.5 to 8) with white internal barrier lining, covered externally with woven library Buckram in dark Navy colour. The high tensile internal mechanism holds approximately 50 pages dependent on contents and supports the pages securely on 4 rings in upright or flat position. A die-cut version in uncovered 1250 micron archival grey folding boxboard is available for more limited budgets. This features a standard 'D' ring mechanism mounted on the inside back and an extra thickness of 57mm to allow between 50 and 100 A-S Pages to be stored depending on contents. It is just as archivally secure and ideal for bulk storage with less frequent access. Manufactured from inert, polyester based clear film giving full archival protection against physical damage, surface reaction and atmospheric contamination. The high optical clarity enhances the appearance of the contents. All formats are unified in a standard overall page size of 317mm x 260mm. We stock one pocket, two pocket, four pocket (postcard) and four pocket (film strip) versions of this page . For your convenience we also split the standard (50 page) packs into 10 page packs. These pages will also fit other 4 'D' ring binders in addition to the specialist Secol A-S System binders. However please be aware they are larger than standard binder (A4) pages. Suitable for ephemera, photos, large postards etc.